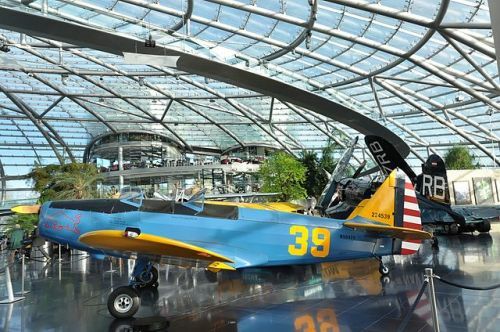 The Hangar-7 in Salzburg showcases an array of historical airplanes, helicopters and Formula One racing cars. 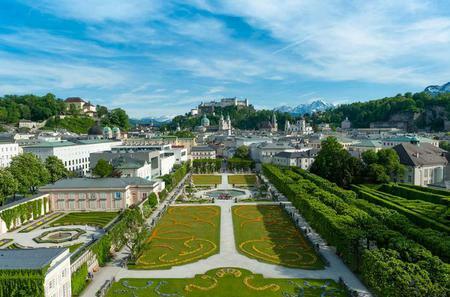 The Hangar-7 in Salzburg showcases an array of historical airplanes, helicopters and Formula One racing cars. Established by Red Bull founder Dietrich Mateschitz, it is also home to the Austrian aviation team Flying Bulls. The airfoil shaped building also has the 2 Michelin-starred Ikarus restaurant and an art exhibition space. The collection of 25 historical aircraft includes a Lockheed P-38 Lightning, Cessna CE 208 Amphibian, Boeing PT-17 Stearman, North American B-25J Mitchell, Chance Vought F4U-4 Corsair and Douglas DC-6, while the collection of helicopters BO 105s, Bristol 171 Sycamore and Bell Cobra. There is also an impressive display of Red Bull and Toro Rosso Formula cars, as well as memorabilia such as Felix Baumgatner Space Jump capsule and flying suits.